It’s almost here. And your loyal blog-writer got the inside scoop. I’m talking about the new Japan Village Walk at Ala Moana Center, a 55-thousand square foot project that’s just a month away from opening. Currently, I took a tour of the not-yet-opened site, and construction is just about complete. In fact, all 60 vendor stalls are ready for move-in, and nearly all the decorative elements are installed. Tables and chairs await hungry customers, and rows of lanterns hang above, which will provide the majority of the lighting for the area (by the way, “special” lights, which will mimic the time of day are also planned for the center). One area along the back of the village walk is dedicated to the animal signs of the Japanese zodiac calendar, while another spot educates patrons about their spirit animals. 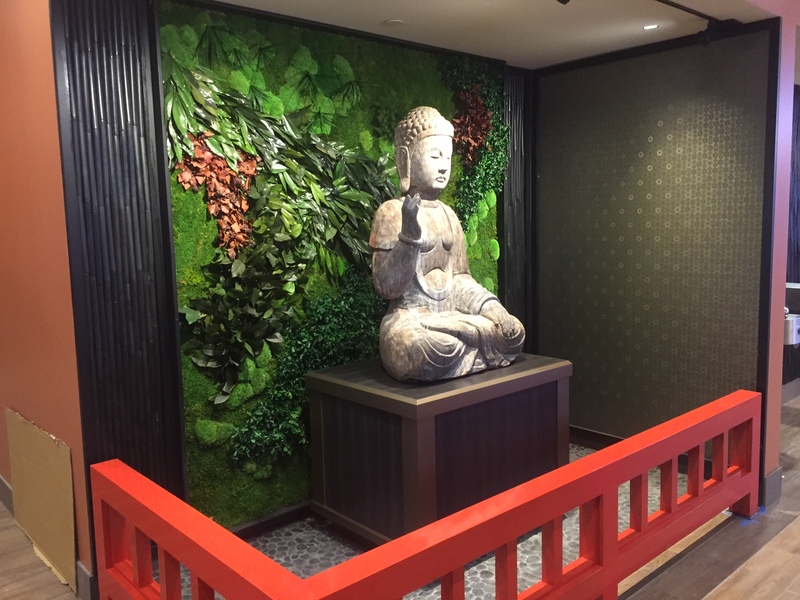 On one wall, you’ll also find a large buddha statue, and, as you wind your way through the vendors, you’ll find an already-built stage, which will host live entertainment three times per month. One unique addition to the Japan Village Walk is the row of Japanese Zodiac animals, where patrons can find out which animal represents their birth year. What’s more — the Vintage Cave Cafe and Vintage Cave Bakery are already under construction, and the bakery will be open for business along with the other vendors in the Japan Village Walk. For those of you who always wondered what life at the Vintage Cave restaurante was like, the Vintage Cave Cafe will be a taste of the original, at a less expensive price-point, of course! SRE, a new real-estate technology start-up also has offices in the new Japan Village Walk, and Japanese-language radio station KZOO-AM 1210, which does live broadcasts to Japan from a glass-walled studio inside Shirokiya, will move to the new location. Food court and beer garden (Yataimura) with 800 seats and a variety of Japanese food, including bento and okazu such as takoyaki, yakitori, ramen, soba, sukiyaki and sushi, as well as five beer counters. The area will resemble the popular Japanese food courts located in the basements of Japan’s major department stores. Shopping alleys (Nippon Komachi) designed to replicate the alleys of old Kyoto with traditional Japanese crafts and artisans. Event square (Omatsuri Hiroba) with festivals three times a month that will include games such as goldfish scooping, water balloon fishing and Japanese candy sculpture. 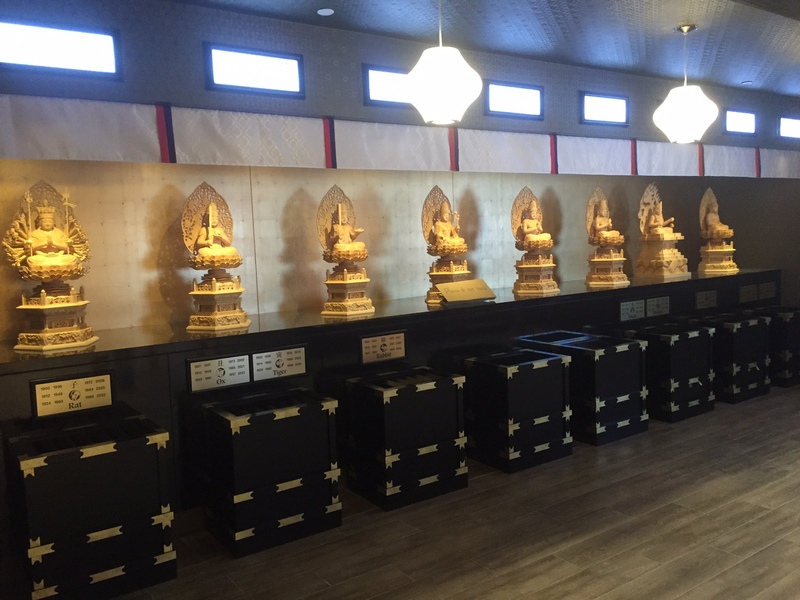 Guardian spirit sanctuary with statues depicting each of the 12 animals of the Japanese zodiac. A large buddha statue stands guard at the Japan Village Walk. According to the Star Advertiser, in 2014, Shirokiya had sales of $35 million. The current store has 25 food vendors, 25 retail vendors and 250 seats, while the new location will have 800 seats and is projected to generate more than $100 million in sales, Mori said. For visitors to Hawaii who are interested in strolling through “Kyoto,” the Waikiki Trolley makes a stop at Ala Moana Center, and you can make a stop there as part of your Oahu Super Saver All-Inclusive Package. Just let your agent know you’d like a Waikiki Trolley Pass as part of your package. The Japan Village Walk is scheduled to open on June 25th.